The Full Moon on the 23rd of June 2013 will look bigger than your standard full moon. This is because the Moon will be closer to the earth than at any other time this year. Astronomers call this a perigee full moon. Astrologers, thanks to Richard Nolle, call this a supermoon . There are a few super moons every year but the June 2013 full moon is the most super. This full moon falls only 22 minutes after the moon’s closest approach to earth for 2013 . According to Richard Nolle, we can expect an increase in tides, as well as more storm and seismic activity for a few days on either side of a super moon. At the personal level, we might expect the usual full moon effects to be more intense. 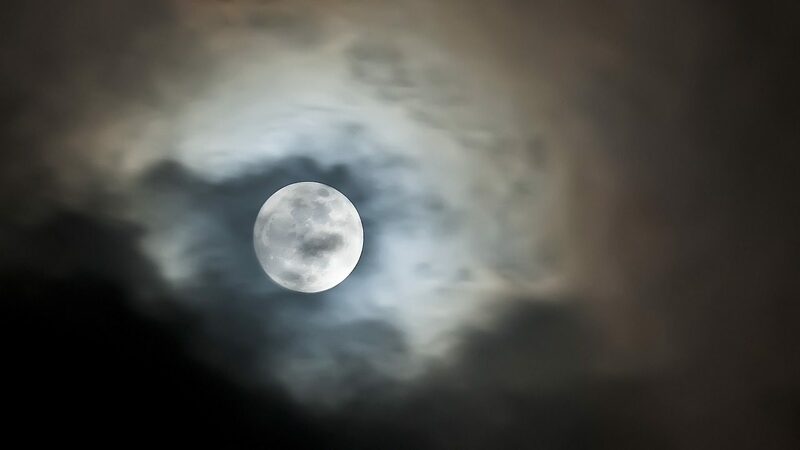 A full moon generally makes us more sensitive and emotional. Intimate relationships take on special significance and we become more concerned with home and family. We tend to pay more attention to our subconscious, with our intuition having a greater say in things than our more rational, conscious side of the brain. The June 23 full moon falls at 2 degrees Capricorn. In the constellations, this is the point of the Arrow in Sagittarius the Archer. The star here is called Spiculum (spear), which is part of the Lagoon, or Trifid nebula. According to Eric Morse, this star can cause morbid fear or religious paranoia for some, but for others it can manifest as deep connectedness to the universe and a positive philosophical outlook . Which way it goes depends on how the star is aspected. Moon conjunct Pluto is wide in orb at 8 degrees, but it does add to the super moon’s intensity of emotions. A much stronger influence comes from Moon opposite Jupiter, which will exaggerate the super moon emotional intensity. So, this really is a full moon of emotional extremes. Feelings should be running very high and they will be most difficult to control. Jupiter can be self-indulgent and over-the-top when opposite the Moon. The Jupiter urge to go overboard at the emotional level is amplified with the Sun so close, plus Jupiter in on the massive fixed star Betelgeuse in the Orion Constellation. This is a strong and arrogant star which is threatening to explode into a supernova at any time. So far, we have an emotionally charged super moon ready to polarize religious and moral views, sending a rush of bible bashers and other assorted crazies onto the streets. Thankfully, Moon sextile Saturn will provide emotional maturity and tone down our exuberant emotions. Moon sextile Neptune adds empathy and insight. Full moons are not only associated with insanity and insomnia, the increased subconscious activity makes them ideal for dreaming, magic and all variety of spiritual and occult work. Saturn trine Neptune means we can turn dreams into reality. This imagineering aspect links to the full moon, creating a minor grand trine aspect pattern. This encourages the practical application of the spiritual wisdom that the full moon carries. Saturn trine Neptune links to the Sun to create a grand trine aspect pattern. This brings inspiration and conscious awareness of the dream or vision. Put it all together and we have a Kite aspect pattern. This full moon is very magical. With heightened receptivity, there is great potential for the inflow of spiritual wisdom, resulting in revelations and self understanding. Through dreams, meditation, or through gut feelings, a roadmap for achieving our highest expectation should materialize. The key to using this roadmap is to stay focused and down to earth. Kite flying requires skill. Over zealousness, religious euphoria, or overconfidence will lead to loss of control and the inability to materialize the dream. The backbone of the kite is the critical component. At the end of the day, any full moon, even a super moon, boils down to one aspect. Sun opposite Moon challenges us to stay focused and remain objective. Listen attentively to your heart and your head, then balance it out to find the middle road. Place great value on close relationships, listen attentively to both verbal and nonverbal cues, from family and partners. They have a stake in this and they want you to succeed, so don’t be too proud to compromise. Teamwork will result in skilled kite flying and a happy ending, when the dream touches down. Los Angeles California USA, Vancouver Canada – 04:32 PDT, June 23. New York and Florida USA, Toronto Canada – 07:32 EDT, June 23. London UK – 12:32 BST, June 23. New Delhi India – 17:02 IST, June 23. Bangkok Thailand – 18:32 ICT, June 23. Sydney Australia – 21:32 AEST, June 23. 1. SUPERMOON – What It Is, What It Means, Richard Nolle, AstroPro. 2. Most “super” supermoon of 2013 on June 22-23, Bruce McClure and Deborah Byrd, EarthSky. 3. The Living Stars, Dr. Eric Morse. I have Mars conjunct asteroid Ariadne at 4 Cap natally. I wonder how the moon will activate the sextiles between Saturn and Neptune? Hmmm…. i’m a libra with scorpio rising … how will this super moon affect me ? Hi Jamie, This is the only Supermoon of 2013 and it is also the closest Perigee all year. This is very powerful. The midpoint of the Sun and Moon touches Obama’s progressed Sun within 36 minutes of arc. The FM has not actualized yet but he has dropped 8 points in the polls this week, Scandals of IRS , NSA and Benghazi haunt him and now here comes the Big Moon squaring his progressed Sun. It is also Squaring Biden’s Progressed Neptune but the Super Moon falls on Biden’s Progressed Mars. This Full Moon is trine Bidens Natal Moon by about 1 degree orb. 9 houses from his natal moon so should be very good for him. We may see a more prominent Biden, possibly president if Obama is impeached. The astrologically based Merlin Project said last year that Obama’s Time Tracks fade in 2013.
yes u right .it’s because of me really . i have some new for him for all really .